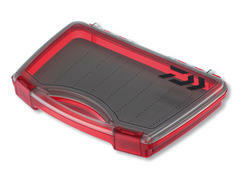 Within this small box with slit EVA board, stinger systems as well as mini-spoons and plugs etc. can be stored conveniently. This large box with quick release fastener can be applied for a plethora of applications. Stinger systems, streamers, spoons etc. can be conveniently fixed to the slit EVA board. 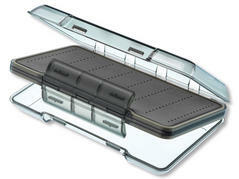 Thanks to the high lid even trebles of up to size 2/0 can be stored. Within this small box with slit EVA board, flies, streamers as well as mini-spoons and small plugs etc. can be stored conveniently. 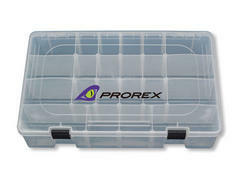 This small box is perfectly suited for the save storage of swivels, hooks etc. The magnet at the bottom prevents the unwanted loss of small parts. 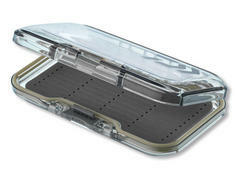 Thanks to four lateral fasteners and the silicone sealing, these tackle boxes are optimally protected against infiltrating water and rain. 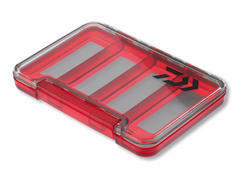 Ideal for the storage of lures and supplies. 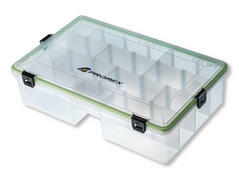 High-quality boxes for keeping lures and other fishing equipment. The XL box of 36x22.5x8.5cm is ideal for large lures like plugs, jerkbaits, swimbaits etc., which do not fit into regular flat boxes.